EVENT MANAGEMENT / EVENT PLANNER : Entrust the requirements of your event to Chameleon and we will ensure that the event is executed to perfection with the utmost professionalism. EVENT PLANNING: Wouldn’t it be wonderful if you could merely outline specifications for your event, and the entire evening was to simply materialize as you envisaged? When you turn your event over to the Chameleon team you can be rest assured that this is exactly what the outcome will be. CORPORATE HOSPITALITY & EVENTS: Corporate events can be a logistical nightmare to coordinate for any organisation. Getting in touch with Chameleon Events to coordinate/organise your corporate events from start to finish saves valuable time and eliminates the stress factor for you. WEDDINGS: The day you have always dreamt about is fast approaching and you deserve the perfect wedding. Let professional certified wedding planners coordinate, execute, and manage the finer details while you enjoy your fairytale wedding and focus on the love you share with that special someone. There is no need for you to worry about the suppliers, vendors, guests, or any of the aspect of the day. It is our mission to ensure the bride, groom, parents, and wedding parties simply sit back and relax while our team make your fantasy a reality. PRIVATE EVENTS: Coordinating and managing the details of a special event can be daunting. Why leave anything to chance? Our professional event planners will ensure your special event is implemented to perfection in a timely fashion. 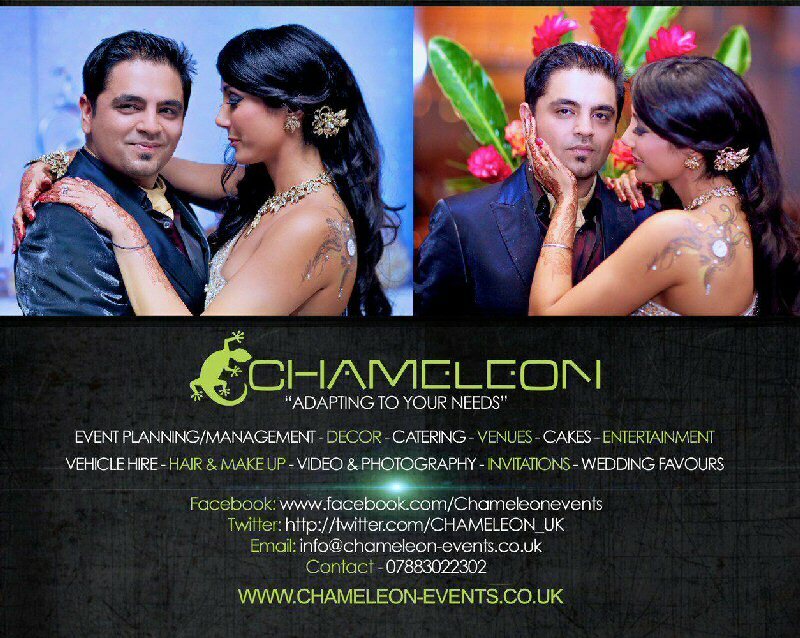 If you would like to find out more about Chameleon planning your wedding, engagement of function please click on the image to be redirected to their site.